Ian Bunting, TE (California): Bunting made 2 catches for 24 yards in a 37-7 loss to UCLA, which is the Bruins’ first victory this season. Alex Malzone, QB (Miami-OH): Malzone was 0/1 passing in a 31-6 win over Kent State. Keith Washington, CB (West Virginia): Washington made 2 tackles in a 30-14 loss to Iowa State. Maurice Ways, WR (California): Ways made 2 catches for 12 yards in a 37-7 loss to UCLA. Jordan Elliott, DT (Missouri): Elliott made 3 tackles and 1 tackle for loss in a 39-10 loss to Alabama. Dele’ Harding, LB (Illinois): Harding made 2 tackles and 1 tackle for loss in a 47-6 loss to Purdue. Damien Harris, RB (Alabama): Harris had 14 carries for 62 yards and 1 touchdown, along with 2 catches for 31 yards, in a 39-10 win over the Missouri Tigers. Jeremiah Holloman, WR (Georgia): Holloman made 3 catches for 26 yards, along with 1 tackle, in a 36-16 loss to LSU. Darrin Kirkland, Jr., LB (Tennessee): Kirkland made 4 tackles in a 30-24 win over Auburn. David Reese II, LB (Florida): Reese made 6 tackles in the Gators’ 37-27 win over Vanderbilt. Darian Roseboro, DE (North Carolina State): Roseboro made 3 tackles in a 28-23 win over Boston College. 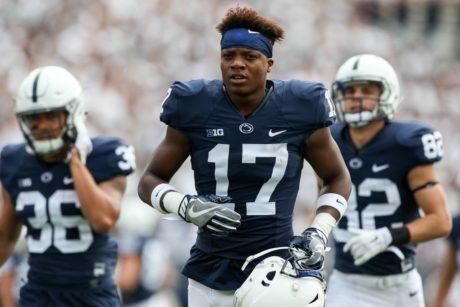 Garrett Taylor, S (Penn State): Taylor had his best career game with 6 tackles, 1 interception returned for 37 yards, and 5 (five!) pass breakups in a 21-17 loss to Michigan State. Victor Viramontes, LB (Riverside City College): Viramontes led the team with 8 tackles and 1.5 tackles for loss in a 37-10 win over Grossmont. Rashad Weaver, DE (Pittsburgh): Weaver made 5 tackles, 1.5 tackles for loss, and 1.5 sacks in a 19-14 loss to Notre Dame. Mike Weber, RB (Ohio State): Weber had 13 carries for 51 yards, along with 1 catch for 2 yards, in a 30-14 win over the Minnesota Gophers. Jay Hopson, Head Coach (Southern Mississippi): Hopson suffered a 30-7 loss to North Texas, dropping the Golden Eagles to 2-3.